That's a hearty soup. Anything with ale is good in my book. It is the first time I see someone put marmite in soup. It is probably my unfamiliarity on marmite/vegemite. It looks like a very comforting stew, never made one with ale. Keep warm and best wishes for the Holiday Season. 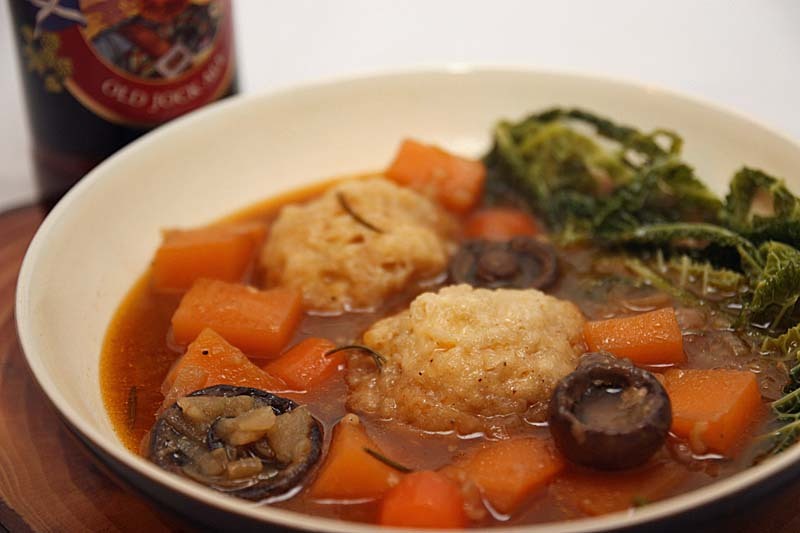 The marmite gives the vegetarian stew a deep flavour. Wow! Looks great! Now I am back with my family for Christmas I am finally going to try some of your recipes as I have people to cook for now! Hope you're keeping warm up there with all that snow! It's snowing and cold here and I sure could use a bowl of this to help warm me up! It looks delish! Mmmm this looks so satisfying. I think I see some of this in my near future. I love adding wine/beer/sherry to recipes. This is my kind of soup! Actually, everything you make I want to eat. Too bad we aren't neighbors! 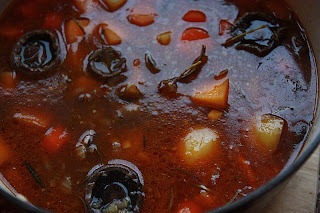 just my sort of stew - though I always hope the alcohol boils off. I feel like a southern softy when I read about your wintery weather - we are whinging about temperatures being under 20 C - though it is the time of year when we put away winter coats and never turn on our heaters! Looks great! 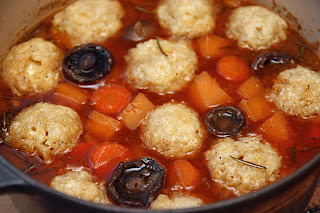 I LOVE dumplings and hearty stews like this. I'm sure the ale would go down well with Steve too. I do hope you family enjoy what you make for them. Please let me know how it goes?! Thank you so much AlisonM. I wish I could serve you a bowl of this, to warm you up on these snowy days! The strong alcohol does boil off, but it does leave a distinct flavour behind. Ah you sweetie, so you too are a 'southern softy' :) I think I'd be happy to swap places with you right now. Thank you so much Louise. looks gorgeous! i cant wait to try this soon! MERRY CHRISTMAS! Thank you so much Claire. I love your rustic, hearty recipes and this one particularly as I love the ingredients. The addition of cheesy dumplings = win in my book! Your right she was. She was fretting whether she would make it back. Yay for rustic. Yay for hearty! Do you want to swap your rain for snow?! I am sure I will be making another pot in not too long - the weather here is rather chilly. Hi, Angeline from Malaysia. U really have a gorgeous blog! Have a nice day. I do hope you get to make this then for your bagpipe playing brother. Please let me know how you find it. Thanks for letting me know about the chickpeas in the Leek and Rosemary soup (I've updated the recipe).I am so pleased to read that it was a hit with everyone. 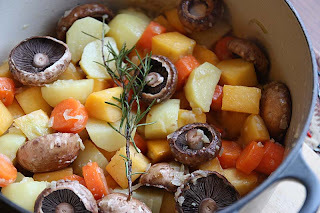 This looks like it would be wonderful on a cold winter evening- delicious! Dearest Mango, so sorry to hear of your cold Christmas. Please accept my warmest wishes to you and your family for a brighter new year. My condolences to you and your family, Mango, on the loss of your father-in-law. Keep his spirit close in this season of light. I know how hard that can be. Thank you for your kind words Eggy. Thank you so much for your kind words Barbara. Looks very tasty!!! Thanks for stopping by TheChieftess.blogspot.com!!! Than you so much for your wonderful words Lexibule, which I had fun translating. Kind wishes and Happy New Year to you. Glad you got to tuck into a veggie version. Yes, I agree marmite can be strong.